Our subscription vegetable delivery program provides farm fresh produce for a (limited) number of member families. We will deliver right to your door a wide variety of vegetables as they become available throughout the growing year. This type of farming is called Community Supported Agriculture. Our vegetable delivery CSA members’ support helps cover the start-up costs of our farm operation. 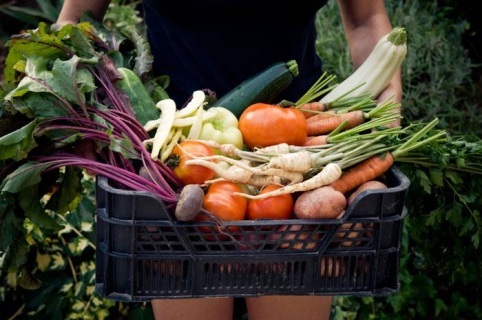 In return, they receive shares in the farm's bounty through our organic food delivery service, as well as satisfaction gained from reconnecting to the land and participating directly in food production. The price for a Bountiful Blessings full basket of farm fresh produce, suitable for a family of four or two vegetarians, is $900 for the entire season approx. 16-20 weeks, from mid June through about mid-October, depending on weather. We estimate the retail value of a full share to be well over $1000. Some of our customers in 2013-2018, have told us they received over $75 worth of fresh vegetables in their weekly subscription. This package is about $45 per week, to get fresh, local veggies delivered to your door. The price for the half-basket, suitable for a family of two or 1 vegetarian is $500. This amounts to about $25 per week. Check with us regarding other options. We are offering a one-quarter order this year for $300 for the season - pick up a the farm only. Delivery not available for the one-quarter order. Please contact us for details on this offer. ​You can pay securely using your credit card or PayPal, or contact us for other ways to pay. See contact form below. Our vegetable delivery service currently serves Hinckley, Big Rock, Waterman, Shabbona, and the surrounding area. If you are in our area you can contact us to reserve for the next season. Our vegetable delivery service reaches capacity quickly, so reserve your spot early. If you are not sure you are in our area use the contact form on our home page to contact us. Use the drop-down menus on the buttons below to select the half-basket or the full-basket. Contact us about the One-Quarter option. Payments are processed safely on the PayPal Secure Server. You can also contact us for other ways to pay for your subscription. Thanks for supporting Bountiful Blessings Farm Produce CSA and encouraging local food. Basket may NOT look exactly identical to those shown in the photos.